There’s an epidemic at our malls: parents taking their small children up and down escalators in strollers of all sorts of sizes and shapes. I ended up behind one such parent yesterday and found strollers heading up and down all afternoon. Some were small, some large. Some had bags dangling off of them, others not. Sometimes parents had both hands on the handles, other times they were balancing the stroller and a drink or cell phone. 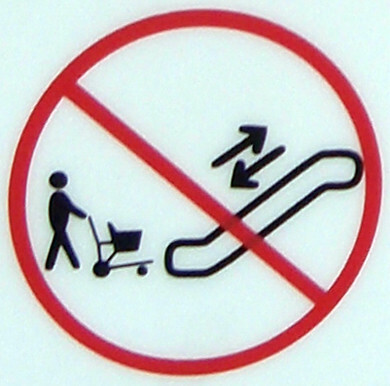 Some escalators have signage to indicate “no strollers” but this mall didn’t have any visible. But, do we need signage for common sense? Given what I witnessed, perhaps we do!! Plus, the statistics reveal a story of danger for young children that most parents don’t realize with escalators, on foot or in a stroller. Coupled with these images, we have compelling data to support how dangerous escalators are to young kids if we don’t use them with more common sense. 51% of the injuries were falls, 36.5% of the injuries were entrapment in this age group (such as a hand being caught in the side). 6% of injuries in this age group were from a stroller, usually from falling out of the stroller. In the under 5 age group, the hand was the most common body part injured and entrapped due to escalator accidents. Of all the injuries seen, lacerations, some severe enough to cause amputation and avulsion, were the the injury most common in the under 5 age group. It’s time we all start using transportation devices the way they were designed and stop playing Russian Roulette with our children’s safety. So, next time you are at the mall, give your self the extra time and use the elevator if you have a child in a stroller. Just think about the future ER visit you’ll be saving.